Dr. Dev A. ManiSundaram is a plastic and reconstructive surgeon in Flowood, MS, and is board-certified by both the American Board of Plastic Surgery and the American College of Surgeons. He performs procedures in all areas of plastic surgery including after weight loss and body contouring, as well as facial rejuvenation treatments and surgeries. Dr. ManiSundaram holds many accolades for his work and has been recognized as a life member of the National Registry of Who’s Who. Renowned for his commitment to his work and his patients, Dr. ManiSundaram is a highly recommended surgeon in the aesthetic industry. Dr. ManiSundaram performs both surgical and nonsurgical procedures for the face, breast, body, and skin. Some of his most popular breast surgeries include breast augmentations, breast reductions, and breast reconstructions. He offers nonsurgical approaches using laser technology for the face, but also performs multiple cosmetic surgeries including facelifts, brow lifts, and eye lifts. Body contouring surgeries for after weight loss patients are among Dr. ManiSundaram’s procedure specialties, such as abdominoplasties and lower body lifts. Dr. ManiSundaram received his Doctorate of Medicine and completed his residency in general surgery at the University of Madras in India. He then went on to perform extensive research in the field of transplant surgery at Rush Presbyterian St. Luke’s Hospital in Chicago, IL. 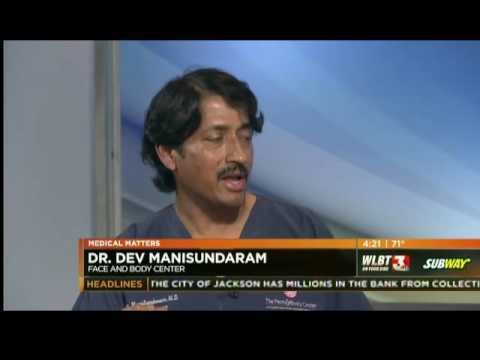 Additionally, he completed a general surgery residency at the University of Illinois MGH, and a plastic surgery residency at the University of Mississippi Medical Center in Jackson, MS.
Dr. ManiSundaram is married to his wife, Brinda, and has three children, Arvind, Naveen, and Krish. View our website or contact our office to learn more about Dr. ManiSundaram’s provided services. Dr. Dev A. ManiSundaram is a plastic and reconstructive surgeon performing numerous procedures for all areas of the face, breast, body, and skin.